Love is in the air, and what better way to showcase your affection than by sharing some sweetness? This Valentine season, Toblerone encourages everyone to #BeMoreImaginative by giving love a lot of thought when gifting your loved ones. Keep it simple and personal through designing your very own Toblerone Valentine-inspired blank packs. Toblerone believes that you don’t need to spend a fortune on expensive gifts to show how much you care. With the Toblerone blank packs, you can put your own bespoke twist on Toblerone’s iconic triangular sleeve. You’ll never run out of options with its mouthwatering flavors – milk chocolate, dark chocolate, white chocolate and milk chocolate with crunchy almonds. To help make your creative juices flow, Toblerone pop-up Valentine stations will be set up in leading malls including Robinson’s Galleria, SM North EDSA, and SM Megamall from February 1 to 14, 2018. Be inspired to express artistic love with the help of local artists and calligraphers who will be there on selected dates as you personalize your very own Toblerone Valentine blank packs. 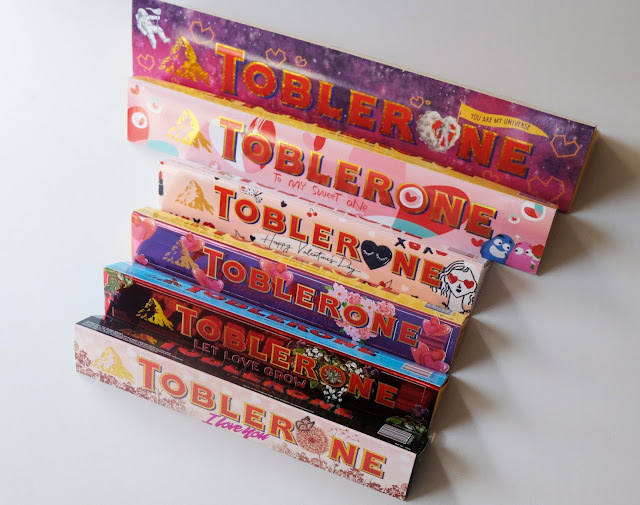 For techy art lovers, visit www.tobleroneph.com to digitally design your own Toblerone sleeves which can be printed out at any Toblerone pop-up Valentine stations for a minimum purchase only. Googly Gooeys, a webcomic turned design blog, puts a very fun and animated spin on her approach on the Toblerone Valentine Sleeve. “My mission is to bring happiness through color, and so I fashioned my design in a way that is fun, happy and colorful,” the artist behind Googly Gooeys mused. Aside from Alessa and Googly Gooeys, Toblerone continues collaborating with talented artists it has worked with in the past. Visual artist Anina Rubio has a more traditional and sentimental take on the season of love, while illustrator Soleil Ignacio remains to incorporate a fashion spin on her design. Graphic designer June Digan’s sleeve looks out of this world with outer space elements she is known for, while graphic artist Juan Rodriguez put an edge to his design with creative lettering and some interesting characters. Brace for a Fiery February on Animax!